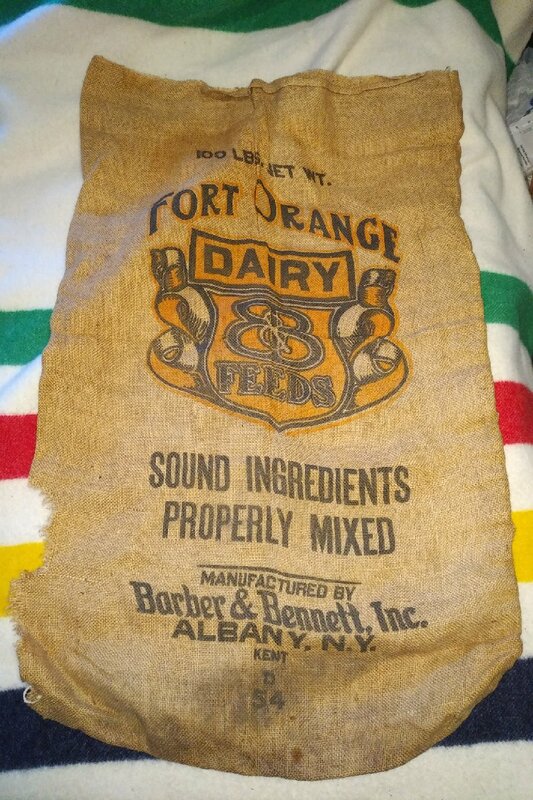 I recently acquired a 100-pound burlap sack from Fort Orange Dairy in Albany, New York. 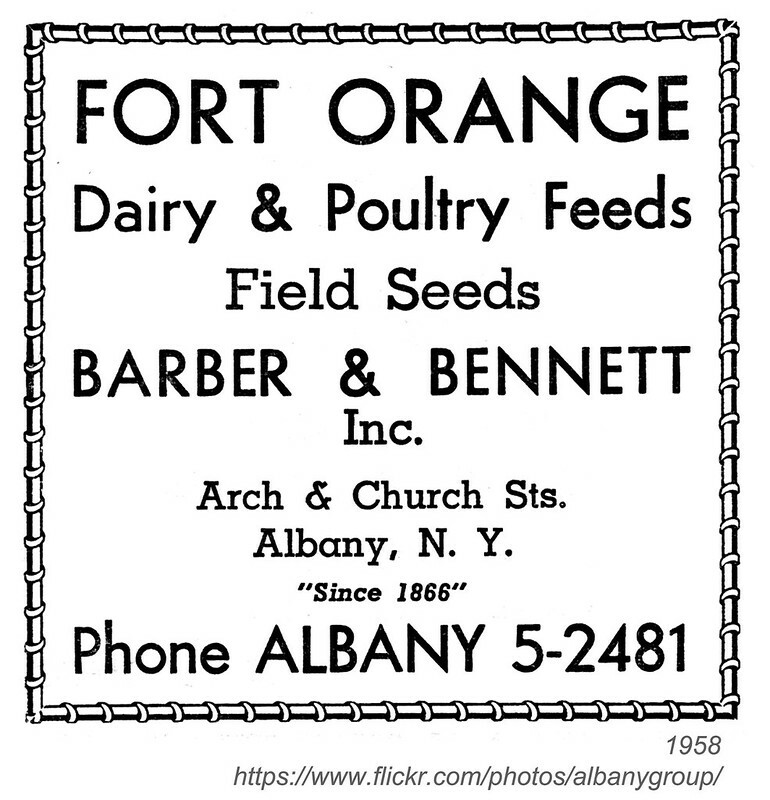 Fort Orange Dairy was a brand of farm and poultry feeds and seeds, produced by Barber & Bennett, who had their offices at the corner of Arch and Church Streets in Albany. Here’s an old vintage advertisement, courtesy of the flickr group AlbanyGroup Archive. To be totally honest, this burlap sack is a major wreck. There’s a big hole on the lower left side of the bag, and there’s some staining along the base. If I stitch this bag up, it won’t be to use as a pillow or a coverlet. No, I think I’ll just stitch up the front, and maybe frame the piece. And I need to get this thing done by November. As in … I want to enter this in Historic Albany Foundation’s BUILT charitable auction. Because, technically, it represents a vintage Albany cultural business. Okay, let’s assess what I’m working with. 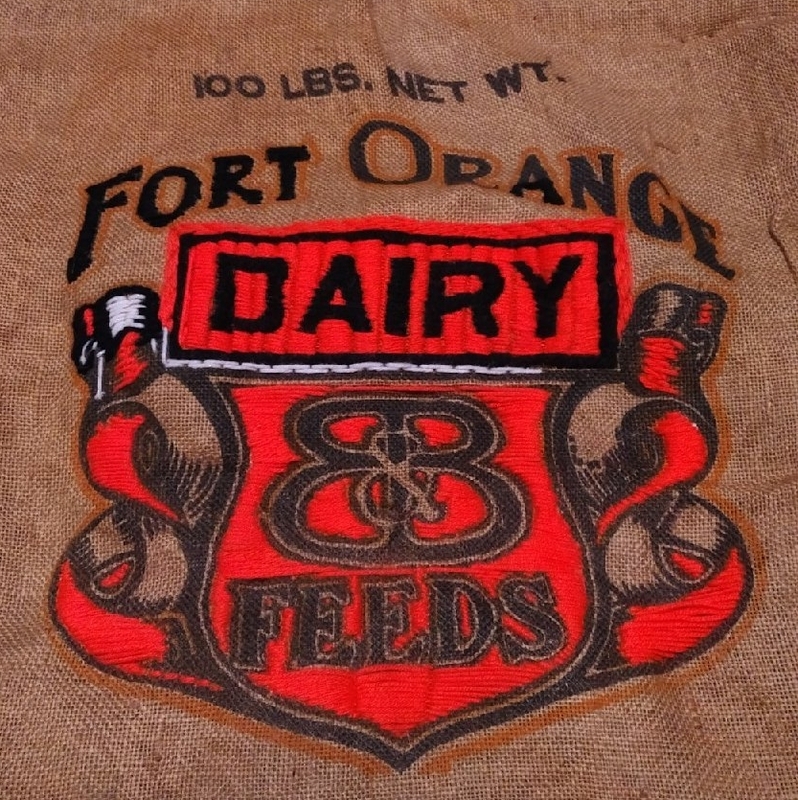 This is a burlap sack from Fort Orange Dairy & Feeds. The available surface is 20×30. And as you can see, it has a nasty bite taken out of the lower left corner. Yuck-o. I looked at the various options. I could go with a neutral color of yarn for the background, maybe mix orange and white and black yarns for the logo, and some other colors for accents. I started with the “DAIRY” portion of the logo. Black border with a sorta dingy orange-like fill. I accented the borders with black yarn, taking care to keep the stitches nice and even. 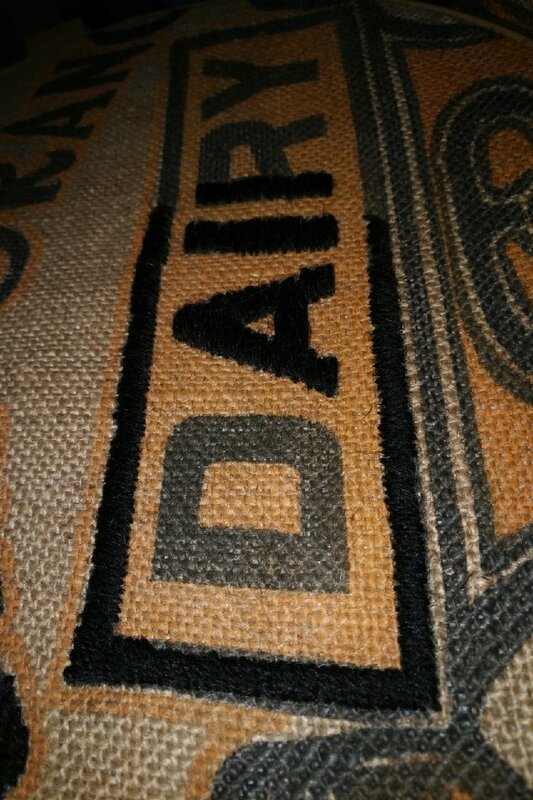 Then I added yarn to the letters DAIRY to make them stand out. Then I added some neon orange yarn to the background. A little hard work, a little patience, and I got this. Figured I’d at least fill out all the orange portions of the bag logo. Then I’ll decide what to do with the rest of the logo. Stitch here, stitch there, keep consistent, don’t overdo things. 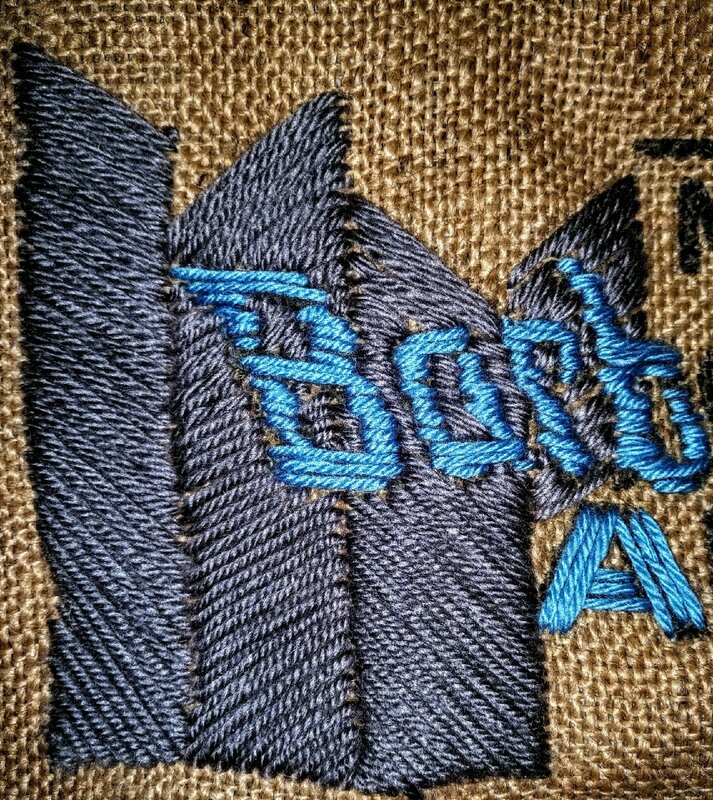 So yeah, as you can see, I’ll add black yarn to where you see black printing on the burlap, and follow up the remaining spaces with white metallic yarn. Now for the background. I decided on a grey yarn for the background, alternating back and forth between diagonal stitching. For the brand location, I used some light neon blue yarn. In order to get this right, I had to count my stitches as evenly as possible. If I can stitch these rows straight up, they should make everything look even in the end. Yeah, I don’t even understand what I just said. I think I’ve got too many art projects on the brain. But here’s the thing. BUILT is coming up in the fall. If I can get this art project done in time … it will be an entry into the show. I really think it will work. It pays tribute to Albany’s agrarian business of old … and it’s a great way to take another burlap sack and turn it into something waycool. Progress and updates to come. And don’t entirely discount the initial pic – ‘nasty bite,’ and all. You’re getting very good at this stitching stuff Chuck. It looks great. Good luck, I know you’ll finish it up by the time you need to enter it.